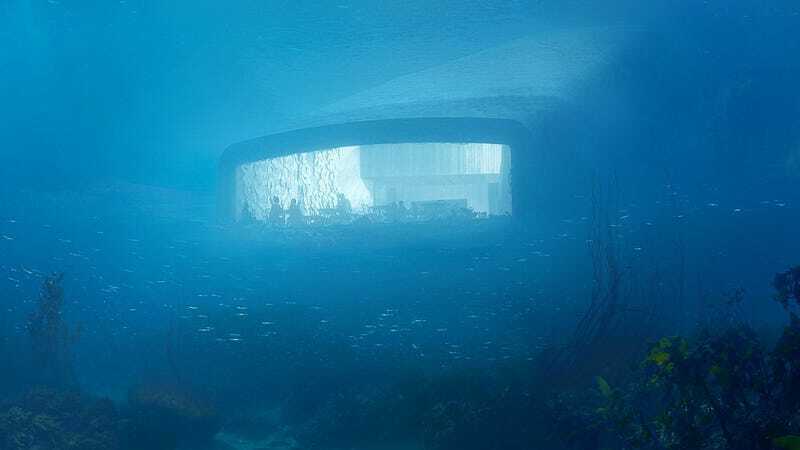 Snøhetta, a Norwegian architecture firm, has made a dream slash nightmare I never knew I had come to life: they’re building Europe’s first underwater restaurant that will also function as a research center. It’s called Under and I think I want to move there. I definitely want to eat there. Maybe. Time reports that the restaurant will have three levels—a “wardrobe area” for guests, then a champagne bar, then the dining room, located on the seabed, with a 36-foot panoramic window that looks out into the North Sea. From above, the restaurant looks like a beached whale, but in a nice, architectural, Northern European way. Mr. Grasdal is correct—this is a “very dramatic way” to “experience what normally is not experienced,” but it could also be a very fascinating and fun way to die? A happy death, maybe, floating like a little sea otter amongst the kelp and the barnacles, before succumbing to lack of oxygen and the brisk cold of the North Sea, but death just the same. Construction on Under will begin next year and the restaurant itself will open sometime in 2019. I will be there.